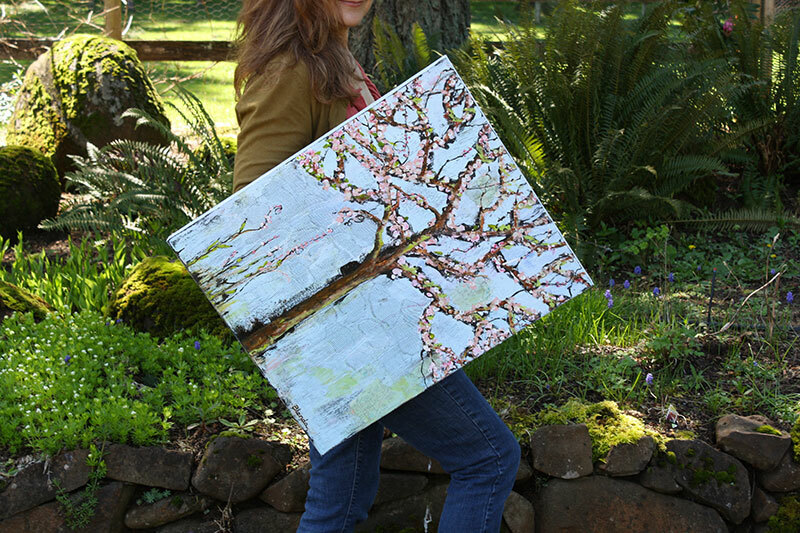 The Spring Collection of original paintings is now live at the Blenda Studio Shop where you will find all things spring; trees with blossoms, birds, and a landscape painting...8 unique works in all. There are 2 more pieces still in the painting process to come later next week or so. Some pieces just listed are fresh off the easel while a few others were painted in 2011 and now available in the online shop for the very first time. The next originals sale will be on Sunday June 24nd. Watch for the Summer Collection Sale. The weather was just plain gorgeous today so we couldn't resist going outside to photograph the art work. Not every shot turned out perfectly. This pretty blossom branch kept getting in the way. The new cover photo for the Blenda Studio Facebook Page. Speaking of FB, connect with me there if you can. Also, come see me on that crazy wonderful Pinterest site. Have you been pinning yet? If not it's loads of fun, never too late to start designing your own style boards of everything you like or want around the web.